Stay on top of your communication with a customize memo. Instead of sending the standard email to your employees or clients, you can make all your correspondence more professional with a memorandum letter. If you do not know the basics of a memo, here is an example of a memorandum letter. A memo is a letter that either documents a problem or solves a problem. 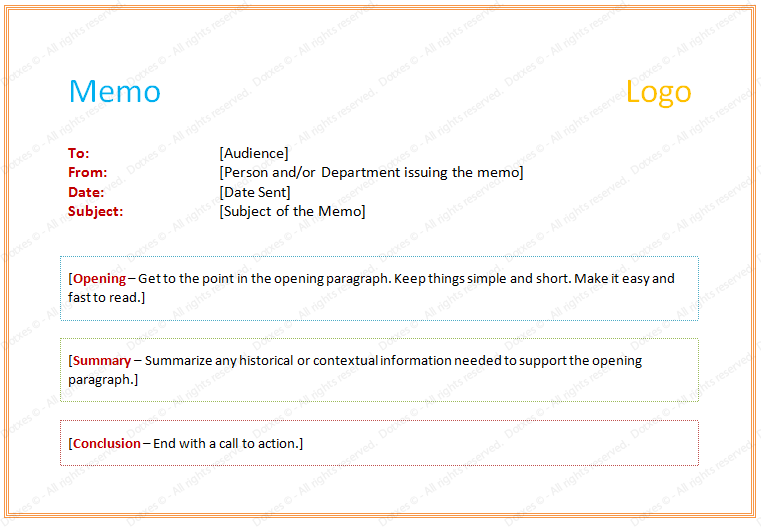 Memos are used to inform the recipient or recipients about changes in policies, price increases, etc. A memo can also be used as a selling or motivational tool to persuade others to take action. An example of memorandum letter that is effective involves connecting the memo writer’s purpose with the needs and interests of the recipient. The best way to write a memo is to follow this example of a memorandum letter. This template is created in Microsoft Word and can easily be adapted to fit your company. At the top of the page, the word “Memo” is clearly stated. Thus, there will be no confusion about what type of document it is. Your company’s logo is also at the top. This personalizes it and is great for branding. The first line of the memo includes the address to the audience. Choose your audience wisely. Next, you would put your name or your department within the company. Under that, you will include the date. The date is one of the most important parts of a memo. Most memos are time sensitive. Now, add the subject of the memo. This example of a memorandum letter goes beyond other templates. It gives you guidelines for the body of your memo. The body should consist of an opening that is short and easy, but grabs the audience’s attention, the summary includes the gist of the problem or solution and includes supporting evidence related to the opening, and the last segment is the conclusion that ends with a call of action. Saved me some time, looks great. Thanks!